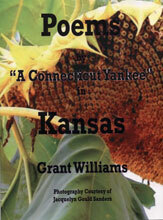 Grant Williams was a self-published novelist and poet from Arkansas City, Kansas. Just before he ended a career as the Vice-President of a Kansas company in Great Bend, his writing career took off. After getting a few poems published in The Topeka Capital Journal, Cappers Magazine, and The Senior Times, he decided it was time to join the Kansas Authors Club. He became the Vice-President in 2009 and 2010. “I learned that our writing can be used in many ways there,” he said. Grant also wrote several articles for the Arkansas City Traveler newspaper, and The Voice of a Diabetic, where he had the lead story in the winter of 2006. Every month, Grant enjoyed reading to the residents of the senior care centers in his local community, some of whom are over one-hundred years old. He assisted three individuals; two of them in their eighties and needing a little push, to put together books of their own. In addition to keeping busy with retired citizens, he also spent time working with young people. For example, he held a writing seminar in Chanute, Kansas, for 8th and 9th graders in order to show the importance of sharing writing. He read to the kindergarten class at a local school, and wrote books of poetry for them. While trying to keep up with all these activities, he also managed to be a member of the community advisory board for the Humanities Department for Cowley College, and he chaired the retired citizens committee at the Senior Center in his local community. He was also the Historian for the American Legion. Grant Williams died on January 3, 2013, at the age of 69. His death was sudden, and occured just weeks after the death of his second wife, Bernice Ann Muhl Williams. "Sitting in the Passanger Seat"
Grant Williams, District 3, Arkansas City, died on January 3, 2013. He was a member of KAC since December 13, 2003, and held many district and state offices: KAC State Vice President, 2007-2009; State Newsletter editor, 2008-2009; Poetry Contest Manager, 2007. District 3 Treasurer, 2011-2012. In 2004 he was honored with an "Award of Merit" for achievements in writing both fiction and non-fiction. Among his prolific writings were the following books: Another Day (2011); Another Piece of My Mind (2003); Big Willie (2007); The Boys From Hog Heaven (2006); From My Hand to Your Heart(2006); From My Pencil Box: Children's Moral Poetry (2005); Hog Heaven and Home (2008); Marbles (2010); My Favorite Poems (2005); Pigs and Packinghouses: a Collection of Short Stories and Poems(2008); Playing in the Sandbox: Child's Verses—Children's Moral Poetry(2004); Poems by "a Connecticut Yankee" in Kansas (2009); Summer of '59 (2009); Ten Degrees (2012); Under the Shade Tree: Children's Moral Poetry (2004). Two links to more information online about Grant and his outreach work can be found on the KAC Writers in the Community page and on the Map of Kansas Literature. His obituary and guestbook are also available online. 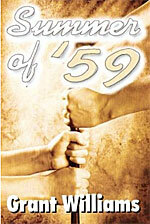 A nice article, "Local author, poet remembered by many," by Foss Farrer, was published on ArkCity.net. A memorial service was Jan. 9, 2013, and Ursula Turner, District 3 president, Coffeyville, spoke in behalf of the club in Grant's honor. She shares a photo from his service (left). A memorial has been established with the American Legion Post #18 in Arkansas City. Contributions may be made through the funeral home.